Since 1995, the Taiwan Celts continue to be a “home away from home” for expats in Taiwan. If you’re in Taiwan and … well, that’s basically all you need. No matter where you’re from, what your sporting background is or whatever your reason for joining us on this lovely island of Taiwan, the fact that you made it this far means you are fully eligible for a place with our club! It also means you have a lot in common with the other Taiwan Celts: the same adventurous spirit that guided all of us out here in the first place!! The main sport of the club is Gaelic football, and our teams participate in friendly and competitive games and tournaments throughout Asia from February to November each year. 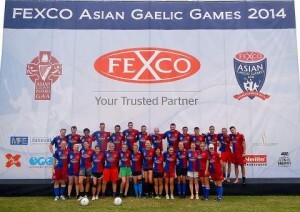 The biggest event of the season is the Asian Gaelic Games, where Gaelic football teams from all over Asia meet to compete for the coveted title of Asian Gaelic Champions. Other annual Gaelic tournaments around Asia include the South East Asian Gaelic Games, the All-China Gaelic Games , and the North East Asian Gaelic Games. The club also hosts many social events throughout the season for all members. Events range from informal gatherings to watch Gaelic football and rugby to social athletic competitions and more. It is possible to join the club as either a touring or a social member. 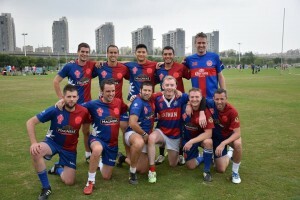 The Taiwan Celts Men’s team were runner’s up in the Junior Division of the 2014 Asian Gaelic Games, taking the grand final into extra time against a tough squad from Vietnam. Paul Rose received an All-Star award for a dominant performance. In 2015 the Men progressed to reach the semi-finals of the Intermediate Division, but in the end they were defeated by a strong Thailand team. Captain-coach Brian Fitzpatrick was honored with an All-Star award for his outstanding play. This season the Taiwan Celts Men’s squad are back in action and looking towards more challenges. The Taiwan Celts Ladies got started a number of years ago, and have proven themselves a force to be reckoned with on the Gaelic football fields around Asia. The Ladies took second place in the Junior Division of the 2014 Asian Gaelic Games. They lost in extra time in the grand final to a strong team from Vietnam. 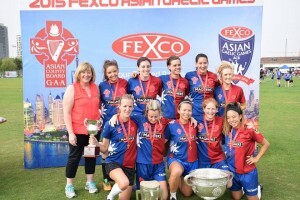 In 2015 the Ladies were winners of the Junior Division of the Asian Gaelic Games in Shanghai. Amy Bucek and Labhaoise Corkery both received All-Star Awards for their outstanding efforts on the pitch. The Ladies are back for the 2016 season to defend their title with new recruits and plans to cause absolute bloody mayhem on the football fields of Asia!